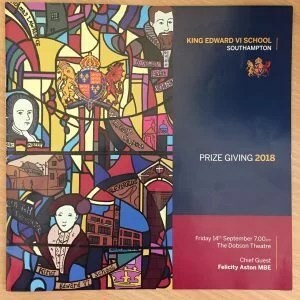 We are delighted that 11 of our former Prince’s Mead pupils collected 15 awards in the King Edward VI Prize Giving evening on Friday 14th September. First year scholarships were awarded to Rio Gawne-Cain, Bella Howell, Rosalind Turner-Hall and Katherine Braakenburg with an upper school scholarship awarded to Edward Bence. Upper School Exhibitions were also awarded to Edward Bence and Sophie Braakenburg. The Bastick Award for Academic Excellence was awarded to Freya McCauley and Sophie Braakenburg. The Robin Lawson Prize recognising the best oral work in French was awarded to Edward Bence. The P&A Love Memorial Prize, given to the pupil who has demonstrated consistent integrity throughout their two years in the sixth form, was awarded to Matthew Stelling. The Martin Skipper prize, given to the lower sixth pupil that has excelled in Philosophy, was awarded to Natalie Oldfield. The Cook Prize for Biology was awarded to Natalie Oldfield. The Business Prize was awarded to Grace Stokes.